We bought one of these babies at the Oakmont Bakery. They were selling smaller versions of them hot on the Strip by the Still-Ler tables of stuff. Pepperoni bread. Never had it, didnt know what it was all about. After A ate almost one of them in one sitting, we had to buy 4 more to take home to freeze to keep the calories coming for our tiny little baby boy. 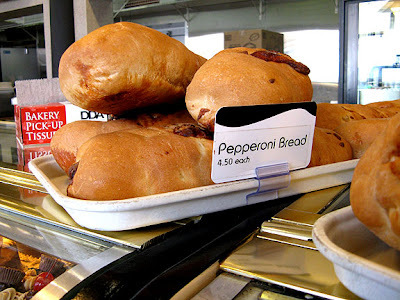 Essentially, you slice this bread and it is packed with pepperoni and cheese--packed so much so that the bread was minimal to the stuff jammed in there. This, like the Primanti's experience is pure Pittsburgh. Perfect for the game either in front of the tube with Iron City or tailgating downtown before the Steelers or Panthers play. If you are in the burgh, get your hands on one of these.